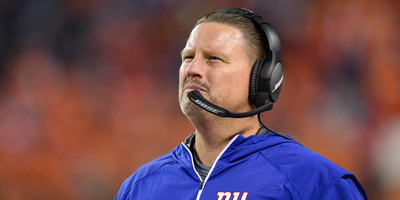 The New York Giants on Monday fired head coach Ben McAdoo and GM Jerry Reese. McAdoo coached less than two full seasons, going 13-15. The Giants were plagued by injuries, uninspiring play, and in-house fighting, with near-constant criticism of McAdoo’s handling of the team and its stars. The New York Giants on Monday fired head coach Ben McAdoo and GM Jerry Reese, according to reports. McAdoo coached just 28 games for the Giants, going 13-15 after being promoted from offensive coordinator. Reese had been with the team since 2007 and was part of two Super Bowl wins. Though the Giants went 11-5 last season and made the playoffs, McAdoo’s second season with the team has been disastrous, as they have gone 2-10. The Giants began the 2017 season 0-4 before losing Odell Beckham Jr. and Brandon Marshall to season-ending injuries. A depleted receiving corps, in addition to a leaky offensive line and shaky run game, only complicated the team’s problems. Their defence, ranked second in DVOA last season, fell to 22nd this season through 12 weeks. Additionally, the team seemed to turn on McAdoo, especially so after his benching of Eli Manning last week. McAdoo twice suspended the team’s cornerbacks for violating team policy, drawing criticism from some of the players. In November, ESPN’s Josina Anderson reported that McAdoo had lost the locker room, though some players still publicly stood up for him. However, the benching of Manning last week seemed to be a tipping point. Manning had the longest active streak of consecutive starts, and seemed hurt to be benched for backup quarterback Geno Smith. McAdoo had offered to let Manning start the games to keep the streak going, then pull him, but Manning refused. Though Manning has struggled this season, many felt the move was a poor diagnosis of the team’s biggest problems. Voices around the NFL came to Manning’s defence after benching, criticising the Giants for the move. Defensive coordinator Steve Spagnuolo will reportedly serve as interim coach, as the Giants enter what may be a long rebuilding period.